I’m too sad to even write a decent blog about that game last night. Just been sitting here depressed about it all morning. I think I’ll just piggyback on Macaroni’s first ever guest post. He got me to thinking about things. SDSU had a great run this year, best season in school history. Proud of the those guys. Proud and sad. UConn bothers me. I want them to lose badly. Did anyone hear the postgame interview? Because if Kemba said they shocked the world, I’m driving up to Anaheim with nunchucks. 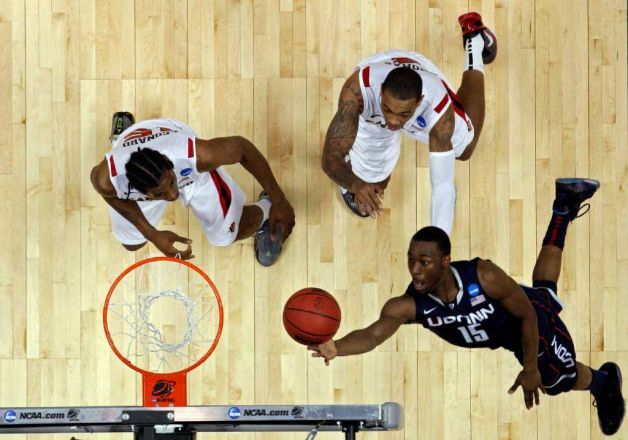 UConn, those bastards, played a good game, but damnit, I just can’t help but wonder what would’ve been had Kawhi and Franklin not gotten technicals. Here’s what I don’t get…as Macaroni pointed out, the officials actually reviewed this call… and they still decided to hand out a technical. I needed to see it again. And Floppy McFlopperson takes a dive! So bush. Good call, refs. Just handing out technicals for walking. So pissed… at both the refs, and myself for bitching about them. Kemba said in interview, “The contact was definitely enough to go down.” That’s it. Car keys. Nunchucks. I’m outta here. This entry was posted in Basketball, March Madness, NCAABB and tagged Aztecs, Elite 8, Huskies, Kemba Walker, March Madness, SDSU, UConn. Bookmark the permalink.